First trams came to Novogireyevo district in 1952; the revenue service was begun on December 5th, that day being a national holiday - The Constitution Day. 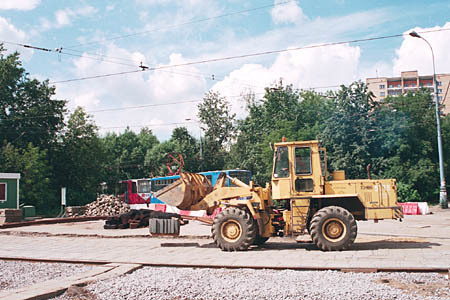 The tramline was extended to Novogireyevo from its previous terminus in Perovo, and the new terminus was constructed beside a railway station with the same name - Novogireyevo. But the history of tram construction in this district was not over yet. 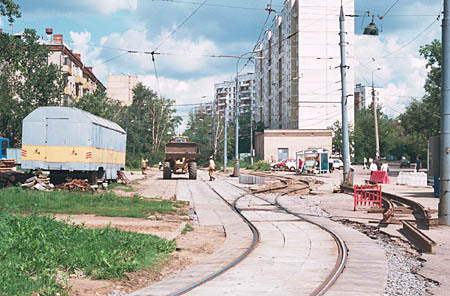 As the district grew up, a new tramline (along Zeleniy Prospekt to Molostovykh Street) construction was started in spring of 1965, and this line was put into service on July 13th, 1966. Unfortunately, this line was born under an unlucky star (or, perhaps, it was not a wise decision to open it in such unlucky-13 date). Ten years and 1 month later, on August 11th, 1976, this line was closed down because of the Metro station construction. There were no objections to restore the tramline after the Metro construction was over, but alas! In 1970's trams were considered "unperspective" and "outdated" (so well-known point of view even today), and this tramline was never restored. Now we have the same situation as it was back in 1952: the Novogireyevo district is served by a single tramline. 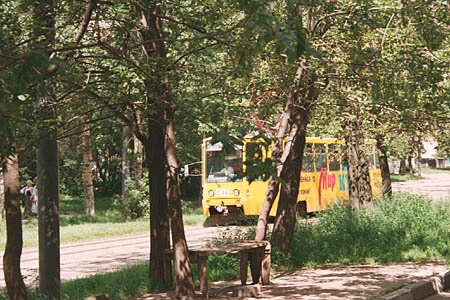 Of course, now there are the Metro stations, as well as a vast network of trolleybus and bus routes, but even now trams carry great numbers of passengers. The line is served by three tramway routes (24, 34 and 37). 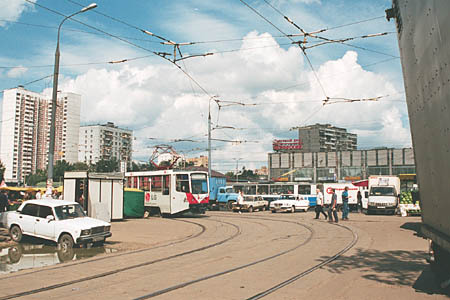 The square beside Novogireyevo Metro station. Long ago there was a junction with the ill-fated line to Molostovykh Street, but now no trace of turnouts is left here. Tram tracks along the 3rd Prospekt. Indeed, this is not a wide highway as the word 'prospekt' means in Moscow usually; just a nice green lane with a tramline. The line ends at the terminus named Novogireyevo, not far froma railway station of the same name. Some track maintenance works are going on, but tram service is not suspended. Another view of the terminus. Note that it has two tracks for departing trams, as well as two tracks for coming ones (not seen here, but they are to the left).